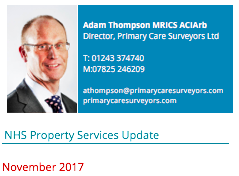 Many Practices have now received proposed Heads of Terms from a firm of surveyors, Montagu Evans, acting on behalf of NHS Property Services. These Heads of Terms outline a lease which in most instances is for 25 years, although the landlord has the right to break the lease upon six months’ notice. However, fortunately, the tenant is also allowed to terminate the lease if they decide to end their GMS contract. Of highest concern to me within these Heads of Terms is the liability for repairs and the potential liability for service charges. The landlord is seeking to make the tenant liable for external and structural repairs via the service charge. In my discussions with NHSPS, they have stated that this only makes the tenant responsible for internal repairs, thereby ignoring the liability in the proposed service charge wording. When challenged, they say they will offer an internal repairing lease until some refurbishment work is done, but thereafter they expect the tenant to take the full repairing lease. Naturally, I am not recommending agreement to such clauses and am only recommending a lease on straightforward internal repairing terms to my clients. Whilst it is easy to enter into a lease without incurring the cost of seeking professional advice, it is clear from the foregoing issues that this cost saving can be a false economy.